Over the past years, several hospitals, and commercial vendors have announced personal health record projects. Few of these are widely deployed, and few are fully integrated into ambulatory or legacy hospital-based electronic record systems. The earliest adopters of personal health records have many lessons learned that can inform these new initiatives. Today’s Health information technologies allow for comprehensive management of medical information and its secure exchange between health care consumers and providers. Widespread adoption of information technology is now commonly regarded as a pathway to improving health care and patient outcomes. Because of these technologies, people everywhere are increasingly benefiting from web-based information technology, and savvy web-users are finding the outdated information systems traditionally associated with delivering healthcare nonsensical. Antiquated IT systems and processes combined with poor information flow are increasingly resulting in systemic under-use, and misuse of healthcare services. Add to this the pressure from the full spectrum of consumers, payers, and policy makers—and all eyes are on the sources of wasted resources, operational inefficiencies, and unsafe care. 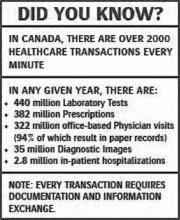 The resulting call for a significant restructuring of our Canadian healthcare system is coming from the highest levels of government, demanding that the industry take advantage of the time, cost, and resource efficiencies promised by healthcare information technology– including electronic health records (EHR) and web-based information exchange. 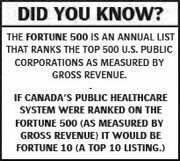 To put the fundamentals in place in Canada will conservatively cost between $10-billion and $12-billion, or about $300 for every Canadian citizen, according to a study by consulting firm Booz Allen Hamilton Inc. However, returns would be enormous, amounting to about $6-billion a year, in the form of improved quality of care, better safety and greater productivity. Advances in health information technology (IT) enable a fundamental redesign of health care processes based on the use and integration of electronic communication at all levels. Most would agree that achieving our Canadian goals requires fresh approaches to health system design, including amongst other things, extending the relationships between physicians and patients (and the tools to help patients be active participants in their own care.) This path improves public health one individual at a time, by building partnerships between health care consumers and providers across the country. However, in order to accomplish this, an honest discussion is required regarding the current standards for system design, evaluation, reimbursement, and usability. Somehow, hospital leadership must enable their organizations to evolve while protecting the financial stability of their institution and the well-being of the patients. This includes providing the modern tools, training, and support to move forward and evolve their health delivery platform. This can be accomplished incrementally by growing the universal understanding of viable, effective technologies---and more importantly sharing our successes and failures as an industry. There is no longer any choice about joining the eHealth revolution. It is becoming the rule, not the exception—and it is gaining momentum everywhere. A proven eHealth portal solution not only leverages, enhances, and augments existing IT investments, but also simultaneously evolves information delivery platforms towards a more open, vendor-neutral, patient-centric environment. Moreover, it is not meant to replace any legacy systems, rather reside “on top of” or in collaboration with any/all existing systems. The Credit Valley Hospital, William Olser Health Centre, and Halton Healthcare Services in Mississauga, Ontario today are sharing patient data through a Web-based electronic healthcare record (EHR) viewer, ensuring all three sites can securely share all patient records—regardless of legacy IT systems or vendors. This extended ability to share patient records promises to have a dramatic effect on improving patient safety and operational efficiency by reducing redundant treatments and medical errors. The Credit Valley Hospital is the latest Canadian hospital to implement Agfa HealthCare’s IMPAX® Clinical Dashboard™ eHealth portal solution (powered by MEDSEEK®). Deployed in just over 90 days, the Dashboard™ extends vendor-neutral, enterprise-wide IT system interoperability between the three disparate hospitals. Today, users have the ability to easily access critical patient information from any PC, handheld, PDA, or tablet PC with Internet access. Data can be retrieved from any of the three facilities – whether it resides at William Osler Health Centre’s two sites (Etobicoke and Brampton) or the three sites of Halton Healthcare Services (Oakville, Milton, Georgetown). The portal solution has the ability to serve the nearly one million residents currently living in Mississauga, Brampton, Halton Hills, and Oakville. Building on this first stage in a long-term eHealth portal strategy, The Credit Valley Hospital plans to eventually extend a patient portal with dynamic transactional functionality to its regional constituents, promising to have a dramatic effect on wait-times and patient safety, while significantly reducing costs and redundancies, such as test duplications due to missing or unavailable information. The federated (Horizontal) architecture demonstrated in the examples above, promises to fundamentally alter the healthcare landscape for every constituent, while simultaneously leveraging all legacy investment with quality and cost advantages not typically seen in healthcare. To remain competitive, hospitals will soon have no real choice but to further transform their delivery platform. Organizations unable or unwilling to keep up are in danger of losing their competitive edge. The trick is to survive the transformation without multi-restarts, multi-level failures and multi-millions wasted. The potential to succeed however has never been clearer. Abstract:Mississauga, ON) A recent partnership between The Credit Valley Hospital (CVH), Halton Healthcare Services (HHS) and William Osler Health Centre (WOHC) means that patient safety, satisfaction and technology will be enhanced at these three organizations. William Osler Health Centre and Halton Healthcare Services recently welcomed The Credit Valley Hospital to the REACH portal. The collaboration between six physical hospital sites in Peel and Halton regions means all of their clinicians have instant access to patient health information stored electronically at any of the hospitals through a secure network called REACH -- Rapid Electronic Access to Clinical Health information. The electronic health information portal allows authorized clinicians access to their patients' information through a secure web browser inside and outside of the hospital environment. This means lab and diagnostic test results, images, transcriptions and progress reports written at one hospital can be viewed immediately by a physician treating the patient at a subsequent visit at one of the other five facilities. Patients move between facilities for different diagnostic tests and procedures that are not necessarily performed at all facilities. Credit Valley's patient information - health record, lab and diagnostic test results and images, transcriptions and progress reports can be easily viewed and updated with new information. "Integrating our system with William Osler Health Centre and Halton Healthcare Services will reduce the duplication of tests and by doing so, reduce healthcare costs." says Dan Germain, Credit Valley vice president and e-Health lead for the Mississauga Halton Local Health Integration Network. "What's most important is the benefit to patients, especially in emergency situations when access to comprehensive patient information is critical." Dr. Paul Philbrook, CVH chief of Family Medicine and current Chair of the Central West - Mississauga Halton Community Family Medicine / Public Health Network of Physicians. He and his colleagues championed the idea of allowing affiliated physicians the opportunity to access their patient records across all local hospital sites. He says "the REACH portal is a welcome advancement of access to patient information and integration locally. This will enhance patient care and safety." "Shared access to the electronic health record is one of the most important collaborations between healthcare providers in a LHIN environment," according to Mississauga Halton LHIN CEO Bill MacLeod. Central West LHIN CEO, Mimi Lowi-Young concurs noting, "the REACH portal contains virtually all of the on-line data contained within the three hospitals and six sites for a population in excess of one million inhabitants." The REACH web portal provides access to over 90,000 inpatient stays and 1,050,000 outpatient visits for the fiscal year ended March 31, 2007. Patient stays and visits from all three hospitals are consolidated into one web portal view for use by authorized clinicians. The electronic health information is only a keystroke away after the clinician logs into the secure REACH network with his user identity and password. There the clinician will see a "dashboard" of patient information options to view the patient as "admitted, attending or referring" and then choosing the pertinent information fields. Unlike traditional web portals, this dashboard is able to access clinical data from disparate systems through one unified view, enabling easy review of patients' records, lab results, cardiology images, diagnostic (PACS) images, transcriptions and progress reports. Because the ehealth record will show the patient's entire health history, important information such as medication allergies will be revealed even if the patient inadvertently forgets to mention the allergy at the time of a visit to one of the five other health facilities currently on the REACH network. "That's especially important," says Germain, "as we move toward the integration of health information from across and between all providers within the province's Local Health Integration Networks (LHIN)." Germain is the e-Health Lead for the Mississauga Halton Local Health Integration Network. William Osler Health Centre and Halton Healthcare Services initiated the electronic highway between their facilities more than a year ago when the Georgetown site moved from within William Osler's cluster of facilities to become part of Halton Healthcare Services. It was important for continuity of care that the patient information stored electronically on Osler's computer system became available to Halton Healthcare providers as well.